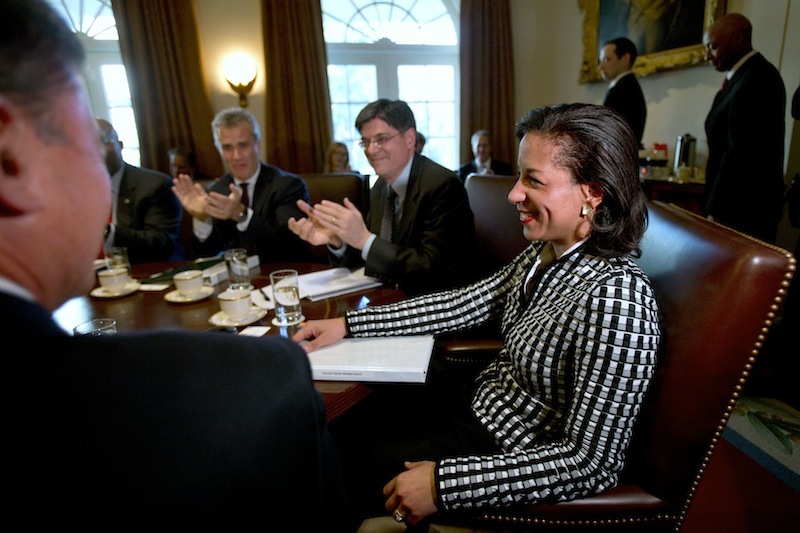 Surrounded Wednesday by his Cabinet members — including Rice — Obama said he could not be prouder of the job she has done. WASHINGTON — President Barack Obama is hailing U.N. Ambassador Susan Rice as “extraordinary” as she continues to face scrutiny over her initial comments about the deadly attack on the U.S. Consulate in Libya. Surrounded Wednesday by his Cabinet members — including Rice — Obama said he could not be prouder of the job she has done on behalf of the United States at the United Nations. His comments came in response to a reporter’s question about whether Rice was getting fair treatment on Capitol Hill. Cabinet members joined Obama in applause. Some Senate Republicans have said they would hold up Rice’s confirmation if Obama nominates her to succeed Secretary of State Hillary Rodham Clinton. Some lawmakers fault Rice’s early explanation of the September attack that killed four Americans.